So… if you believe the post Mr. Steven Samblis posted on his blog page (see below), one would think… that’s it, he’s gone ! Well folks, not so fast. A few things to keep in mind… first and foremost… this is Mr. Samblis we’re talking about here. Most will assume there is some sort of angle, or hidden agenda to the statement. Many will suspect Mr. Samblis is simply hoping to quell all the negativity surrounding his company, by making an announcement he is no longer affiliated with it. Perhaps hoping those that have been following his efforts and actions for years, will fade away and forget about him. Then when the coast is clear, perhaps in a few weeks or months, bam, here he comes again. Also keep in mind, although the vague statement seems to suggest he is walking away from the public company… he still owns the majority shares of the company. Which means… the Board of Directors (since there is, and has been, only one – Mr. Samblis himself) the “Board” could reject the offer of resignation. OR… the Board of Directors (again, himself) could simply hire him back at any time. WOW… what a way to keep your options open, right? Also keep in mind, (again, the statement was vague), it seemed to indicate he would focus on “movie reviews and interviews”. Wait… wasn’t the Imagination TV efforts part of the public company? How does that work… he walks away from the public company, but still focuses his efforts on one of the assets of the public company? Wait… what ??? But, isn’t that what’s been happening for quite some time now? Imagination TV has been in operation, and from all appearances it is likely making a few bucks… but none of those funds seemed to appear on the public company”s financial reports. Perhaps, if what many believe is true regarding Mr. Samblis misleading investors through the use of bogus aliases on a message board, would anyone really be surprised if Mr. Samblis installed a straw CEO in the company to be the public figurehead? Given that Mr. Samblis is still the majority shareholder, and Mr. Samblis makes up 100% of the board of directors, such a straw CEO would be at the mercy of the Board of Directors… i.e. Mr. Samblis. Mr. Samblis could parade the new CEO out as the savior of the company, and not have Mr. Samblis’s baggage in the limelight. The new CEO would be free to pump the company as a fresh start, and oh yes, please by some stock now that Mr. Samblis is out of the picture. So folks… what has really changed??? Does ANYONE really believe Mr. Samblis doesn’t have something up his sleeve??? Well folks… Mr. Samblis… opps, we keep doing that.. we mean Mr. QueFine, posted a post earlier today, that appears once again, to cast Mr. Samblis, and his company Imagination TV (IMTV) in the victim role. Those of you who have followed Mr. Samblis for a long time know this to be where he runs to when he has no data to fight the facts. Let’s look at a few of these statements made in this post. AND, by the way, it has since been deleted, but once again, we managed to capture it before it was deleted. Although, the captured image is not perfect, you can clearly see the post. “He never sold those shares. It’s clear he registered them but the records show he never sold them.” This is a totally ridiculous statement. Documents can not prove a negative. No document can show a non-event. Just because there are no documents supporting a sale, doesn’t mean there was never a sale. But, as has been demonstrated previously, we agree, Mr. Samblis has very likely not “sold” any shares. HOWEVER… acting as CEO of the company, he has CAUSED the transfer of shares to the general public through his numerous convertible loan deals – this IS documented via SEC filings. “It’s a sad reality that you can take any man’s life and dig into it and twist and adjust the truth to make it sound like a circus.” Isn’t this exactly what Mr. Samblis has done to Larry ? Once again, it appears OK for Mr. Samblis to do it, but no one else is allowed. “Calling this guy a con-artist. Saying he lied. Saying he sold shares and many other statements with no factual back ground are unfortunate actions. They effect this person i am sure in a very bad way.” Well… the data seems to support he is a con-artist. Many of Mr. Samblis’s documented actions fall perfectly in line with the actions of a con-Artist. Additionally, there are numerous instances of documented actions that Mr. Samblis lied. For a few examples, see this post. And, once again, this statement attempts to paint Mr. Samblis as the victim. If you want to see some real victims, take a look at all the investors that lost money believing in Mr. Samblis and what he was going to do. “Everyone was in this with the goal of fullfiling their greed.” and “If people lost money after buying this stock the only one they have to blame is theirselves.” WOW… Now that seems to about sum up the care and concern the CEO must have for the loyal investors in his company. Since Mr. QueFine seems to have intimate knowledge of the company and it’s dealings, surely he has insight into the mind of Mr. Samblis. It is simply unbelievable any CEO would make a statement like that ! With that mindset it’s no wonder the company’s stock value is where it’s at today. It would seem to also explain why the CEO, Mr. Steven Samblis did so many convertible loan deals. It must have been all about the money, with no thought whatsoever about the investors. “I read all the press. When the company began working on a project they issued a press release. Like any other under funded company, they had good intentions but clearly did not have the money to follow through.” Well, it stands to reason that the one person that KNEW they didn’t have the money to follow through, was the CEO ! Why then was the press release ever released in the first place if the CEO knew he didn’t have the money to follow through??? The one conclusion that presents itself above all others is… to sell stock ! Also, why is it that every effort, accompanied by a grandiose press release, never came to fruition ? Wouldn’t most reasonable CEO’s realize at some point that maybe I better not put out the press release until the project has met several significant milestones ? “There was no millions of dollars going to the company. When people bought this stock they bought from other people holding it. Every Q and K the share count supports this.” First… no one really knows how much money went through this company because the details are either not reported, or in the case of questionable SEC documents that reported such things as there was no Samblis employment contract, or, there were no legal actions, that if anything was reported is was likely not creditable to investors. Additionally, when unsuspecting investors bought the company stock, they were very likely buying the stock from the likes of Asher, who is on record as having owned a bunch of stock, acquired through the CEO’s convertible financing deals. 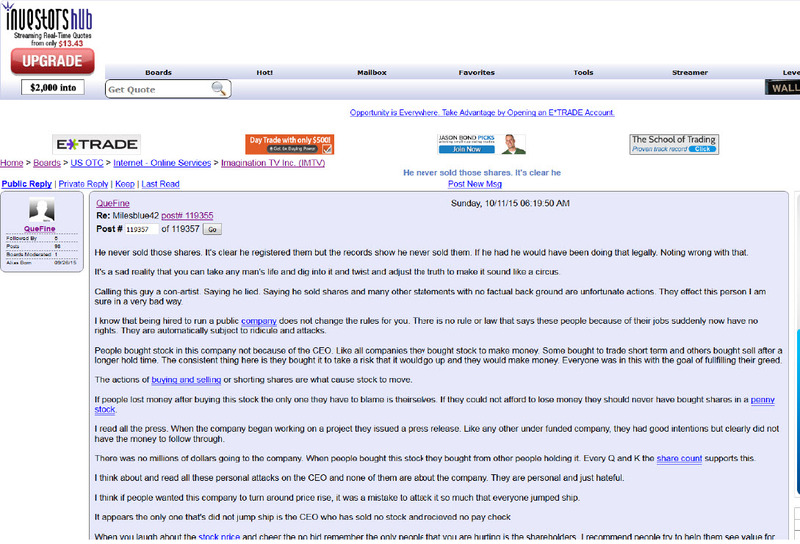 “I think about and read all these personal attacks on the CEO and none of them are about the company. They are personal and just Hateful.” Actually, most of the comments are about the CEO’s actions. Granted, there are some that attack him on a personal level, but here again, the CEO has attacked those that speak unfavorably of him also. Here again, it appears OK for Mr. Samblis to attack others, but to do the same to him is “hateful”. Mr. Quifine… can you really blame investors for hating Mr. Samblis based on their financial losses as a result of the bad decisions of Mr. Samblis, and, what you describe as his likely mindset that investors are stupid for investing in his company, and deserve what they got because of their “greed” ? Shame on you Mr. QueFine ! “I think if people wanted this company to turn around price wise, it was a mistake to attack it so much that everyone jumped ship.” Perhaps that would have been a true statement YEARS ago, when the CEO made a few bad decisions, however at some point investors came to realize much of the above, and although they realized that while their investment was not salvageable at that point, they felt the moral obligation to warn others, based on their own experience and opinion. After all, as you indicated, the CEO thought that investors were greedy and had no one to blame but themselves. “It appears the only one that’s did not jump ship is the CEO who has sold no stock and received no paycheck.” First, just for clarification… can you tell the readers how you could possible know the CEO did not take a pay check? We won’t hold our breath for that answer, however, unless the CEO had a part time job at WalMart or something… how was he paying his personal expenses, like rent, utilities on his living quarters, insurance, food, clothing, etc, etc, etc ? There appears to be very little assets listed in the SEC filings, and little if any operating costs recorded… so where did all the money go from the convertible loans ? We know the massive cost for providing beverages on the set was borne by Reeds, so that can’t be where the money went. Did most of the money go to chasing Larry ??? “When you laugh about the stock price and cheer the no bid remember the only people that you are hurting is the shareholders. I recommend people help them see value for their holdings by finding a way to turn this company around.” So… it’s the investors that need to find a way to turn this company around??? Isn’t it the CEO’s responsibility to turn this company around ??? The CEO has had over 10-years to turn this company around. Do you really expect investors to believe that if they would just start speaking favorably about an unfavorable situation, that would do the trick? AND… they should do this because they know the CEO cares so much about them? This sounds a lot like victim talk, and talk from someone that wants to do more convertible loan deals in order to fund the CEO’s lifestyle – for which he has never taken a paycheck according to you. And saving the best for last… “They spent hundreds of thousands keeping the company public. All the money they borrowed went to that so they own a public company. I would encourage people to help the company find a way to take advantage of the public vehicle. If they could find a company with a good product and cash flow they could put it in the company and turn his around, then all the shareholders could recover.” This is just a totally ridiculous statement on so many levels !!! So, are you saying, or in fact admitting, that the current company is not capable of surviving on it’s own, and the only thing that can save it is to acquire another company with cash flow ??? Mr. QueFine… perhaps you are so new to Investors Hub that you do not remember how that worked out with Punch TV, or the Runway deal (in spite of all this research you say you have done). You expect investors to fall for that again ? AND… investors see (or don’t see) all the cash flow from Imagination TV, which is supposed to be part of IMTV – the public company, yet in spite of advertising running on all Mr. Samblis’s websites… not one dollar is reported on the SEC filings. Where is that money going ??? And, if you say that the advertising investors see is there free of charge… what kind of CEO places advertising on their sites for free? Is that the type of CEO you expect investors to invest in ??? Mr. QueFine… you really need to do some more homework ! Do you not look at the documents that support the above? Or, do you look at those documents and not believe your lying eyes? Why would you support a CEO that you indicated thought that investors were stupid and greedy? WHAT is in it for YOU ? You really need to come up with something a little stronger than “trust me” in order for people to take you seriously. There is this thing called Google nowadays. Potential investors can simply Google the facts and decide for themselves if the data supports an investment or not. No longer do they need to rely on simply what a CEO tells them. It may be a shock for you to learn that some CEO’s will lie from time to time in order to promote their company, and therein, themselves. Sad, but true ! Folks… this is an excellent post by MilesBlue42 over on Investors Hub. (click graphic to take you to the post). MilesBlue simply nails it ! He exposes the truth about Mr. Steven Samblis, CEO of Imagination TV (IMTV). MilesBlue42 better be careful, for if he tells too much truth about Mr. Steven Samblis, he too may get labeled a “Cyber-Stalker”. Mr. Steven Samblis, opps, we mean Mr. QueFine, seems to know a lot about Mr. Samblis and his company in the short time he has been registered on Investors Hub. It could be said that Mr. QueFine appears to be stalking Mr. Samblis, by doing so much research on Mr. Samblis and his company Imagination TV. In fact as we mentioned in our last post, it appeared Mr. QueFine was lurking on Mr. Samblis’s web pages during the wee hours of the morning, hitting the refresh button every few minutes, just waiting for any new information to be posted. However, it appears that because Mr. QueFine posts only favorable information about Mr. Samblis, it’s not stalking. Nor does it seem concerning to Mr. Samblis that Mr. QueFine’s information is inaccurate and misleading. It appears you only earn the coveted badge of “Stalker” if you post truthful articles, and back such up with supporting evidence. It’s a badge Friends wears proudly ! Mr. Samblis appears to take full advantage of his rights to free speech in attacking Larry, and the many others that post accurate and supported DD. However, Mr. Samblis would seek to deny those very same rights to anyone who speaks unfavorably of Mr. Samblis. Most people would call that hypocritical. Could it be that Mr. Samblis is not aware Mr. QueFine is posting inaccurate information about Mr. Samblis? Folks… please be careful when reading message board posts from posters that appear to be supporting a company, stock, and CEO that bear no resemblance to a successful company, or even a company with the likelihood of any potential. Posters like these do not have your best interest in mind. Most times they are simply attempting to promote the company so more stock shares can be pledged to equity financiers in exchange for funds to maintain the lifestyle of the promoted company’s CEO’s. Fortunately there are folks like MilesBlue42, and many others that post truthful information, supported by documentation and/or links, to prove the information is accurate and valid. As we have said many times before… who you going to believe, a poster on a message board – or your lying eyes when you see the supporting evidence ! Let the evidence be your guide ! Samblis – playing the victim… AGAIN ! Well folks… maybe you have seen the over 2000-word late night rant by Mr. Steven Samblis on his Tumbler page regarding how Larry-The Stalker is cyber-stalking him. The one thing that jumped off the page for Friends, was the fact that not one word of those 2000+ words were devoted to rebutting ANY the negative information that is freely available to anyone who cares to google Steven Samblis. Or, not one word devoted to accepting ANY responsibility for the failure of his company. It must be tough for Mr. Samblis to accept the fact that after over 10+ years in business, and squandering millions of dollars of investor funds, his company’s stock is at point zero zero zero worthless. His lack of attention to these issues speaks volumes to the validity of the information that has been written (and documented) about Mr. Samblis). Once again, Mr. Steven Samblis chose to shoot the messenger, rather than address the issues. Additionally… it was simply amazing how Mr. QueFine knew of the post almost immediately, and ran over to Investors Hub to let all those anxious IMTV supporters know of the article and post the link. Mr. QueFine must have been sitting on Mr. Steven Samblis’s tumbler page just hitting the refresh button just in case Mr. Samblis was going to post something that night. WOW… what a guy. Mr. Samblis… try doing what MilesBlue42, and many others have said… stop scapegoating, and take some responsibility for your actions, and devote every waking hour to creating shareholder value. Investors that once believed in you lost thousands of their hard earned dollars, and not once has anyone seen an apology. Just like the investor dollars you have squandered… you have squandered your integrity in the eyes of shareholders. Many have stopped believing in what you say, and will only accept results at this point, if you are to regain ANY integrity back (if that’s at all possible at this point). Mr. Samblis… your late night rant was another example of you squandering your time to scapegoat. Investors will likely be disappointed again that you didn’t use the time for a more productive use. Your post simply made you look foolish, shameless, and desperate. Benjamin Franklin is quoted as saying… He that is good for making excuses, is seldom good for anything else. FINRA has this neat function on their web site called “Broker Check“. (http://brokercheck.finra.org/). When you enter Steven M. Samblis, you get a report on his history. It’s an interesting read. Granted, there are some items in the report that have been previously reported, and discussed, however there are a few things that apparently haven’t. What perhaps was not know previously was that there were TWO “Regulatory Events”. One on or about 2/10/2000, in which it appears Mr. Samblis Stipulated and Consented, to the Sanctions of “AGREES NOT TO ENGAGE IN THE OFFER OR SALE OF ANY SECURITY FROM OFFICES IN THE STE OF FLORIDA OR TO INDIVIDUALS RESIDING IN FLORIDA FOR 10 YEARS“. WOW… 10-years… that seems like a degree of sanction associated with a serious offense. And… Mr. Samblis agreed to it. The second one has been previously reported, mentioned, and discussed, however, what was interesting is, it appears Mr. Samblis never paid the fine because the fine was discharged in his bankruptcy filing April 1991. So it appears Mr. Samblis never actually paid the fine. That Regulatory Event also apparently blew back on his boss, Donald G. Asquith. OPPS ! Mr. Asquith is listed in the document as Mr. Samblis’s supervisor. WOW… its one thing to screw up, but to have it blow back on your boss is not good for the performance review. The text goes on to indicate that the decision against Mr. Samblis was appealed, but the decision was affirmed – i.e. he/they lost the appeal. Now, in the section that appears to allow for a statement by the accused, Mr. Samblis states he sued one of the witnesses in Civil court and won a judgment of $215,000 dollars. However there is no indication that money was received by Mr. Samblis. Wouldn’t that be ironic if the witness discharged HER judgement in a bankruptcy. Also, the Regulatory Statement makes note of THREE customers involved in the Event. No mention as to why Mr. Samblis chose to only go after one of them. The text includes an explanation of the violation, indicating Mr. Samblis mailed an “incomplete and misleading” investment strategy to those customers. Many might say that Mr. Samblis engages in that practice to this date, by providing press releases that are apparently designed at enticing investors into buying IMTV stock. Well folks, there you have it. Read it, and decide for yourself if these Regulatory Events are old news and have no bearing on Mr. Samblis’s activities today, or, are simply reinforcement to support activities such as press releases that never seem to materialize into into anything more than paper and ink, and, what many believe is the use of bogus aliases on message boards to mislead potential investors into buying IMTV stock. Is Mr. Steven Samblis smarter than the SEC ??? If the speculation is correct, and many think it is, Mr. Samblis must be so arrogant as to think he is smarter than the SEC. Even after having been once cited by the SEC for improper activity, apparently he thinks they will never be able to prove he is actually the person behind all these aliases. In other words, Mr. Samblis apparently thinks he is smarter than everyone else. If it is really him, he is thumbing his nose at the SEC. The SEC regulations were aimed at prohibiting “any manipulative or deceptive device or contrivance.”, which basically means, any intent, action or vehicle, such as message boards, to contrive a scheme to mislead others. Certainly the posts of mrighttrade, dotd, zurich, Bzippy, FLWright , SunTzueyes, HouseSmith, CVeradero, and now QueFine would qualify as a scheme to mislead, should those aliases in fact be Mr. Samblis. Perhaps, in light of that regulation, and the specificity of the intent, readers can see why a CEO, if they were engaging in such activity, would be sensitive about any discussions surrounding such. One can only imagine the negative repercussions of being found guilty of such activity, and possibly more so if that CEO had been previously cited by that same authority. Readers can now certainly understand why Mr. Samblis is so adamant those aliases are not his. But… readers are not stupid. They can easily refer back to those aliases and notice the content, context, word choice, and specificity of responses, and draw their own conclusion as to who they think is actually behind those aliases. It is assumed some have already brought this to the attention of the SEC. Perhaps, the SEC is already looking into this issue. The SEC rarely, if ever, comments on ongoing investigations, so it is entirely possible they have been collecting data for a while. After all, the posts are public for all to see. Should you decide that the above should at least be investigated by the SEC, here is the link to their complaint page. The SEC treats all tips, complaints and referrals as confidential and nonpublic, and does not disclose such information to third parties, except in limited circumstances authorized by statute, rule, or other provisions of law (i.e. court order). There are also additional confidentiality protections if you so desire. See the enforcement tips page here for details.